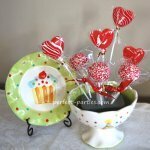 Marshmallow lollipops are easy to make and will add color to any party table. 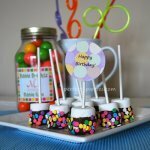 Simply dip marshmallows into chocolate and decorate with sprinkles of your choice to match the theme of your birthday party. Chocolate should be warm not hot. Chocolate scorches very easily and will taste burnt if heated too long. Microwave 60 seconds on 50% power, stir well, and repeat 30 seconds at 50% power until melted. Insert lollipop sticks into the marshmallow almost half way. Dip marshmallow into chocolate a little more than half way. Tap stick gently while slowly rotating the stick to remove excess. The rotating makes it smoother all around. Add sprinkles and candy decorations. Place on parchment paper to set. It will not stick using parchment paper. 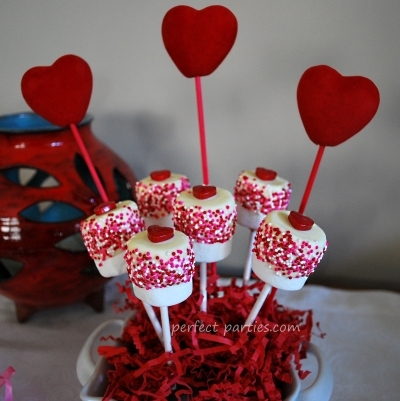 Here's a fun way to serve your marshmallow lollipops. Arrange it bouquet style in a party themed dish with other decorative items. Add some colored grass to match and you've got a perfect centerpiece for your birthday party. 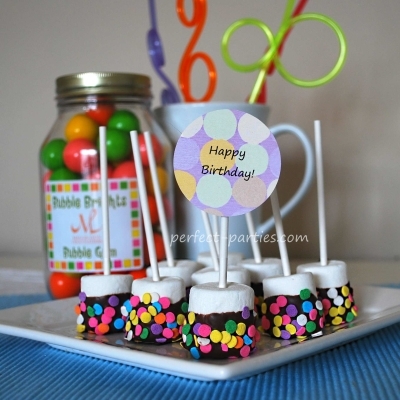 Customize your lollipops by using different colored sprinkles to match the party colors. 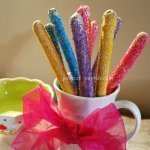 All types of sprinkles can be used and you can add a small candy on the top to dress it up. Dry this one standing up. Using a lollipop stick, poke holes into a piece styrofoam about 3 inches apart so lollipops won't touch while drying. Be sure styrofoam is wide enough that it won't tip while the pops are in it drying.